Brushed nickel is a common metal effect found on furnishings and other decorative household items. Brushed metal is metal with a unidirectional satin finish produced by polishing it so it has a dull polished appearance. Nickel finishes are slightly darker than chrome finishes in colour, giving them a warmer appearance. The soft, satin appearance of brushed nickel is sometimes considered more attractive than shiny chrome due to its subtlety. Rounded brushed nickel end caps for 54mm wall mounted handrails. These stair accessories will add the finishing touch to any suitable handrail. Materials you can choose from include metal and pine. 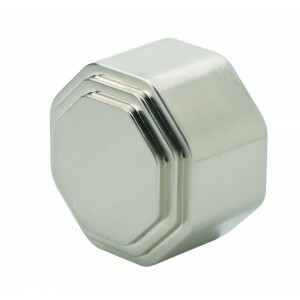 Our metal end caps are available in a selection of finishes, including black, antique brass and chrome.